More than any other country, the United States has adopted cacao for military purposes. It was a part of Revolutionary War rations, where colonels received four pounds of cacao a month, and in the Civil War, volunteers used hot cocoa to fortify and calm injured soldiers. Without question, chocolate assumed special prominence during World Wars I and II. In World War I, volunteers from the YMCA—known as “Red Triangle Men” due to their insignia—followed American soldiers throughout the European and North African theaters, establishing morale and comfort services. Soldiers came for cigarettes, coffee, hot cocoa, and commercial sweet chocolate bars. Like the Aztecs and Spanish centuries before, the intention was to use the chocolate as an emergency source of energy. Officers found, however, that soldiers would eat the sweet chocolate immediately, rather than saving it for emergencies. Consequently, in 1937, army officials partnered with the Hershey Company to design a chocolate bar that would provide energy but could be resisted until needed. Captain Paul Logan issued four specifications: The bar must weigh four ounces, be heat-resistant, contain high stores of energy, and taste “a little better than a boiled potato” (“Ration D Bars”). Hershey chemist Sam Hinkle developed a 600-calorie bar that, due to a low sugar and high oat content, soldiers would find less appealing (“Ration D Bars”). The resulting product, named Field Ration D, was to be served as a part of every soldier’s daily supper ration. Hershey’s was not the only chocolate company to benefit from military contracts, however. World War II also represented a boon to the Mars Company. M&M’s, which were patented in 1941, immediately became popular with American soldiers overseas. Because the chocolate was coated in a hard candy, it withstood high temperatures. The U.S. Army incorporated M&M’s into C-rations, and soon Mars was selling M&M’s to the military exclusively. The contract proved profitable – in 1941, shortly after production began, Mars was able to move from a start-up facility to a large factory in Newark, New Jersey. The factory operated at full capacity: it produced 200,000 pounds of candies per week. By 1945 it was manufacturing 600,000 pounds a week, nearly all of which went to the military. With slogans like “Now 100% at War!” Mars emphasized—and benefitted from—its affiliation with the military. 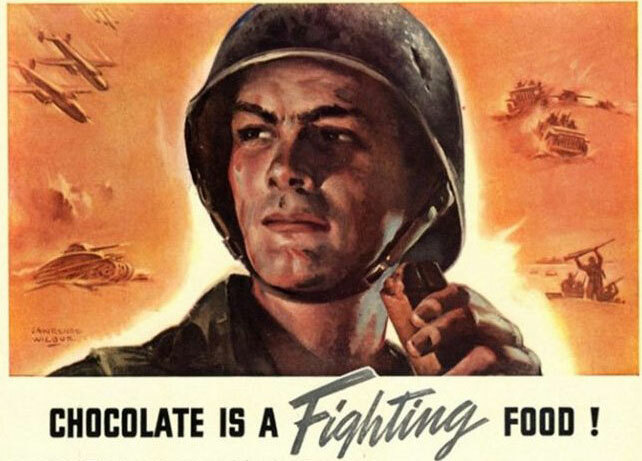 The military use of chocolate during World War II thus allowed Hershey’s and Mars to secure lucrative contracts. In turn, the companies emerged from war more successful and profitable than ever before. In 1950, a group of U.S. Marines fighting in North Korea got stranded without enough ammunition. They managed to get to safety, but only with the help of … wait for it … Tootsie Rolls. Imagine that! Have you ever wondered why Tootsie Rolls hold significance with the Marine Corps? During the Korean War, the First Marine Division met the enemy at Chosin mountain reservoir in subfreezing temperatures. Out of ammunition, Marines called in for 60mm mortar ammo; code name “Tootsie Rolls.” The radio operator did not have the code sheets that would tell him what a “Tootsie Roll” was, but knew the request was urgent; so he called in the order. Soon, pallets of Tootsie Roll candies parachuted from the sky to the First Marine Division! While they were not ammunition, this candy from the sky provided well-needed nourishment for the troops. They also learned they could use warmed Tootsie Rolls to plug bullet holes, sealing them as they refroze.